The consortium of Mitsubishi Hitachi Power Systems Europe (MHPSE) and Polimex-Mostostal (PXM) are constructing the 1,075MW coal-fired power plant in Kozienice, Poland. Image courtesy of Mitsubishi Hitachi Power Systems Europe (MHPSE). Construction of the project began with the laying of foundation stone on 21 November 2012. Image courtesy of Mitsubishi Hitachi Power Systems Europe (MHPSE). The ultra-supercritical power plant will operate at a net efficiency rate of 45.59%. Image courtesy of Mitsubishi Hitachi Power Systems Europe (MHPSE). Construction undergoing at Kozienice 11 power plant, which will come online in 2017. Image courtesy of Enea SA. The Kozienice Power Station, located in Świerże Górne near Kozienice, is the second biggest power generating facility in Poland, behind the 5,354MW Bełchatów Power Station. 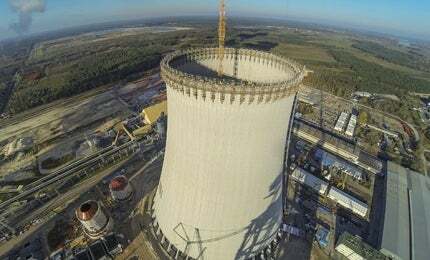 A subsidiary of Polish power company ENEA Wytwarzanie, Elektrownia Kozienice owns the power station, which currently consists of ten units with a total generating capacity of approximately 2,900MW. ENEA Wytwarzanie engaged Mitsubishi Hitachi Power Systems Europe (MHPSE) and Polimex-Mostostal (PXM) for constructing a new 1,075MW coal-fired power plant at the existing Kozienice power station. With a designed net efficiency rate of 45.59%, the new plant will be Europe’s biggest coal-fired power unit and the most modern one with supercritical parameters. It is expected to support the Polish economy, which is estimated to rise 3.2% in 2014 and 3.4% in 2015. Foundation stone for the new power plant was laid on 21 November 2012 and commercial operations are expected to start in the second quarter of 2017. First oil ignition is anticipated to be made in August 2016, and the first delivery of steam to the turbine is expected to be made in December 2016. The new power plant will consist of utility steam generator and other auxiliary equipment, to be supplied by MHPS. The generator will have a capacity up to 1,100MW with 300 bar pressure level, 600°C live steam temperature, and reheat temperature of up to 620°C. The utility steam generator will be made up of coal bunkers, coal mills, firing equipment, flue gas cleaning and other balance-of-plant equipment. At Kozienice 11, supercritical technology will be unified with extensive flue gas treatment in order to meet the most stringent environmental protection requirements. This kind of unification is expected to boost the efficiency of coal-based electricity generation by approximately 40% while reducing carbon and other emissions. All the major components at the plant, including the MHPS boiler and turbine, will be monitored and controlled by using Emerson Process Management’s Ovation™ control system. The project will also feature Emerson’s Ovation™ safety instrumented system to comply with the SIL3 requirements for boiler protection. The SIGMA 2000-BQDV pumps, to be supplied by Sigma Polska, will be used for the cooling water circuit at Kozienice 11. The 2000-BQDV pumps will operate at an efficiency rate of 88%. The first four boiler columns of the power plant were fixed on the foundation on 12 June 2014. The boiler supporting structure has a weight of 3.25t. Two crawler cranes, supplied by Sarens Polska, will be used to lift the components weighing more than 180t. MHPSE is the supplier of the boiler, steam turbine, generator and auxiliary equipment, and air quality control system (AQCS), and also acts as the erection / commissioning advisor for the project. Vattenfall Europe is developing a new hard coal-fired power plant along the Elbe River at Moorburg, Germany. Babcock-Hitachi K.K. (BHK) is the supplier of the flue gas desulphurisation plant for the 1,075MW ultra-supercritical power generating unit. P&M was entrusted with the construction, assembly and supply of the service equipment of the power plant, and will also provide electrical equipment around the main circuit. ENEA Wytwarzanie contracted ILF Consulting Engineers for providing engineering services for Kozienice 11 unit. Pentair was awarded the contract for the supply of valves for the boiler, turbine and balance-of-plant portion. MHPSE contracted Hamon for the supply of two electrostatic precipitators (ESP) for the power unit. Hamon also received a contract from P&M for the supply of a natural draft cooling tower and a flue gas injection system. MHPSE subsidiary Donges SteelTec is the supplier of the boiler steel structure for the plant.